In 1961, a large convent for the Sisters of Mercy was completed to accommodate their ever increasing numbers. 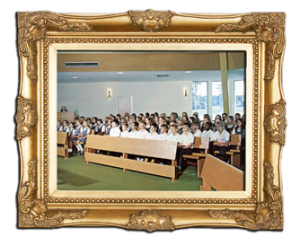 Ultimately, though, their vocations weren’t able to keep pace with the parish needs; and so, in June of 2008, the Little Servant Sisters of the Immaculate Conception arrived from Cherry Hill, New Jersey, replacing the Sisters of Mercy in the parish school. 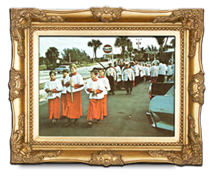 The original multi-purpose building that served as a church was beginning to burst at the seams with the growth of the parish population, so, on October 12th, 1969, Archbishop Carroll of Miami broke ground for a new church. 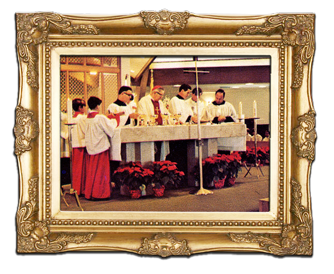 Within a year, the present church was completed, and Archbishop Carroll dedicated it on December 19th, 1970. 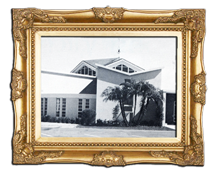 In 2002 a new state-of-the-art parish multi-purpose building and gym was built. Known as the Parish Family Life Center, it contains a hall dedicated to the memory of Father Kellaghan. In the years following, Father Kellaghan was succeeded by Fathers John Skehan, Francis Guinan, and the current pastor, the Very Rev. Canon Thomas Skindeleski. With the continued support of many loyal parishioners, a renovation of several of the facilities has been undertaken. The parish now boasts a beautiful, permanent chapel for Perpetual Adoration of the Blessed Sacrament, and a newly enhanced youth center. The weekend assistants are Msgr. Stephen Bosso, S.T.D., S.S.L. and Rev. Jay Haskin.